All women love bunny rabbits, therefore, we all love bunny necklaces. 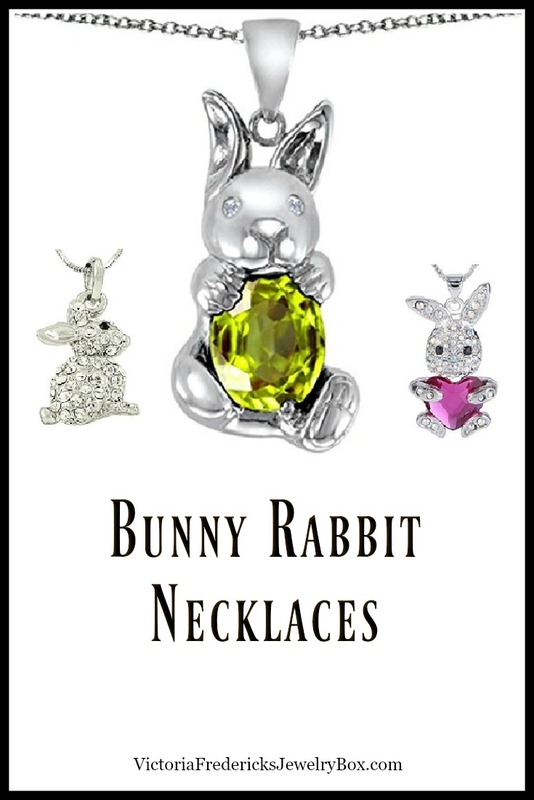 Bunny rabbit necklaces are especially popular around Easter, but many of us wear them year round. We don’t really need a special holiday to enjoy wearing jewelry fashioned after one of our favorite creatures. However, they do make lovely gifts for Easter. Which bunny necklace to buy depends on the woman who will be wearing it. 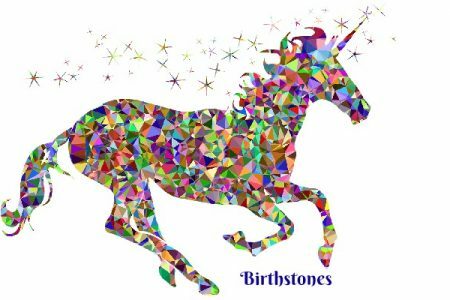 Some love shiny crystals, whole others prefer the simplicity of a simple outline. I have featured some of each style so you can easily choose your personal favorite. This pretty necklace features a crystal bunny holding a heart gem. The bunny is created with Swarovski crystals that will glisten when hit by light. Swarovski crystals resemble diamonds, but they are nowhere near as costly. The pretty pink heart that the bunny is holding, would be a constant reminder of the love you hold in your heart for the recipient. The pendant is a nice size to wear and would be appropriate for office, school or anywhere. It is just over 1″ in length. It comes with a chain that has an extension so the pendant can be worn at different lengths to accommodate the blouse or dress neckline. Just like a real rabbit, this bunny necklace will truly capture the heart of everyone. If you prefer simplicity, the silhouette shaped bunnies are fabulous! The sentiment “some bunny loves you” comes to mind when you see this precious rabbit. The pendant is just shy of 1″ wide and includes an 18″ chain. It is made of sterling silver and is very modestly priced. The silhouette bunnies below look like a mother and baby bunny sitting side by side. It would be a lovely gift for Mother’s Day or a precious addition to an Easter basket for a daughter. This necklace is definitely a gift for special occasions. 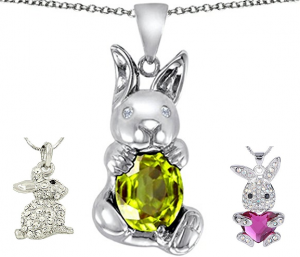 The bunny is made of sterling silver and is holding a simulated Peridot that reminds me of an Easter egg. The pendant is also available with a simulated citrine. The detail is of this piece is fabulous. Look at the little paws and facial features. Plus, those ears are truly adorable. The pendant comes with an 18″ chain. Whichever necklace you select is sure to be a delight to wear.